This is a news highlights page. If you'd like a changelog instead, click here. 190405. 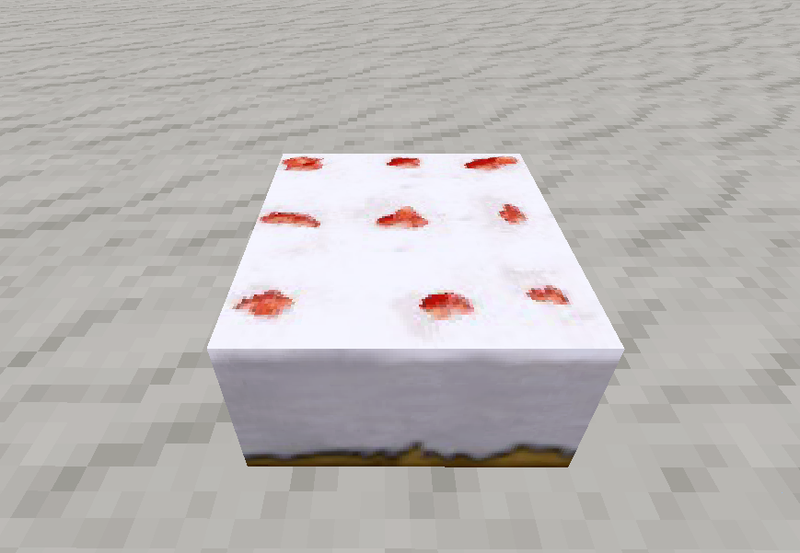 Delicious and nutritious Minetest cake. This is a drop-in replacement for TenPlus1's illegal cake which copied textures pixel by pixel from Minecraft. Thanks go to Poikilos for spotting the theft and creating new textures. 190330. Introducing Final Minetest Vombie. Here, the mob has burst into flames due to sunlight. 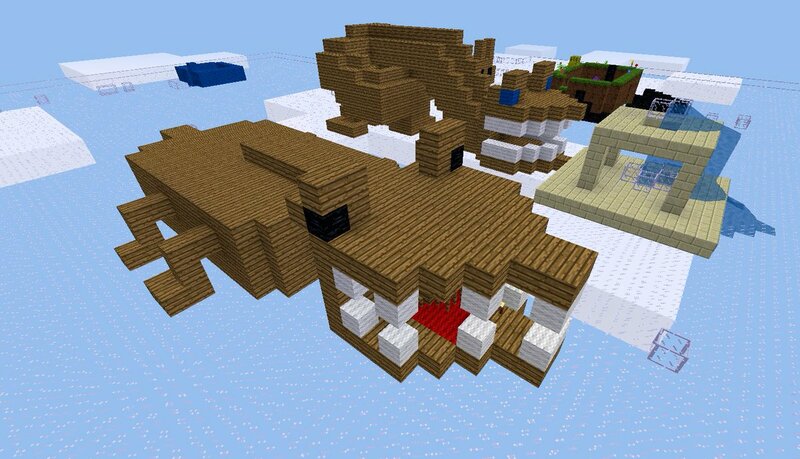 This feature is from Sapier Vombie but is now part of the Minetest Mobs API. Any supernatural entity can be set up to flame on. It's obviously an essential feature. 190330. New mob: Mdoege Skeleton. 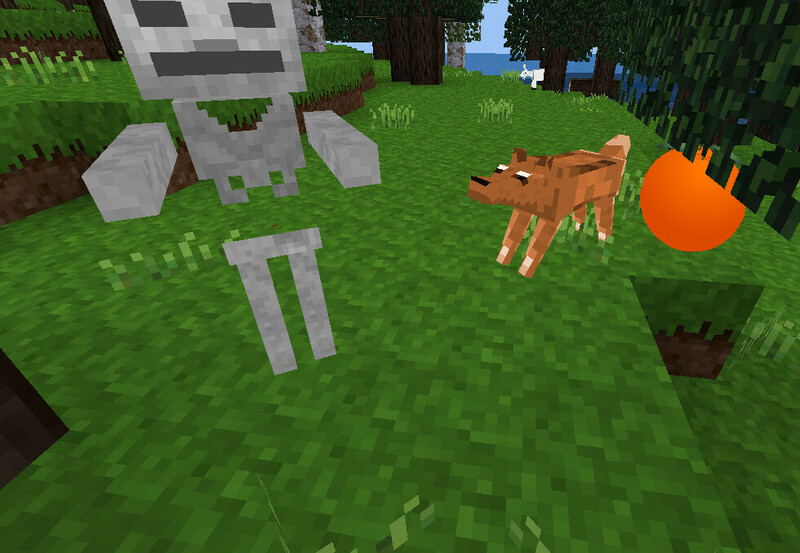 Here, faithful Fido attacks a skeleton that's risking daylight to wreak havoc. We feel that CoderMobs, taken together with CoderSea, is the most complete general-purpose “mobset” that's ever existed. 190329. Meet Lawrence Elk. Poikilos's new high-definition elk is so good that it's spooky. 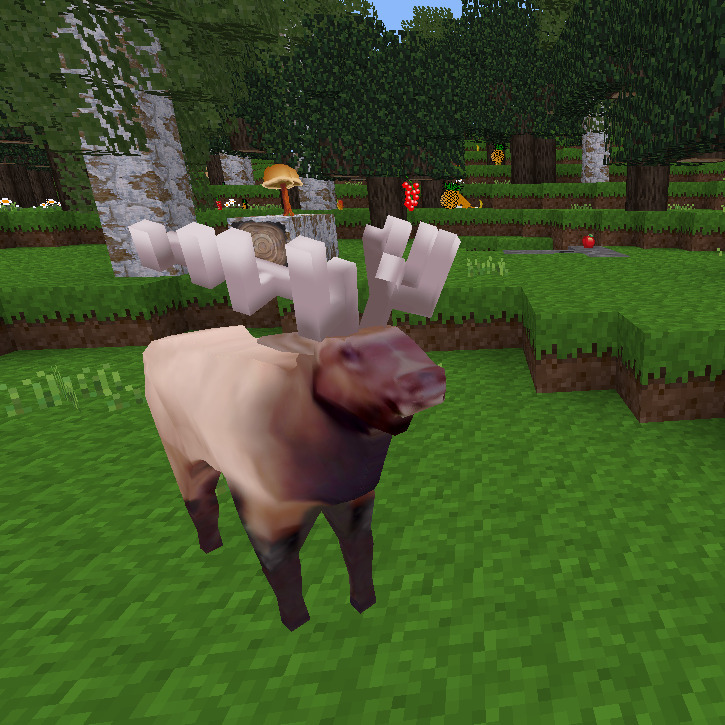 It's the state of the art in virtual Cervidae. 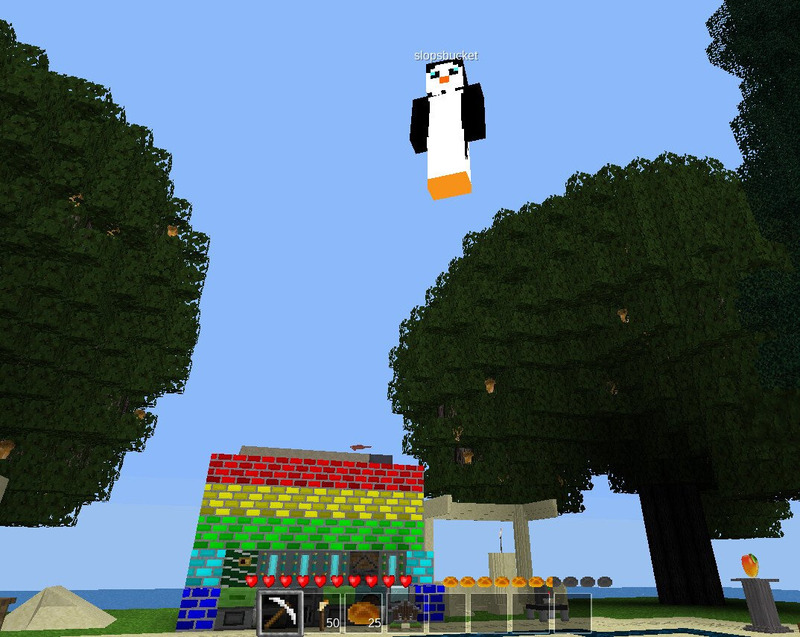 Only in Final Minetest. 190328. 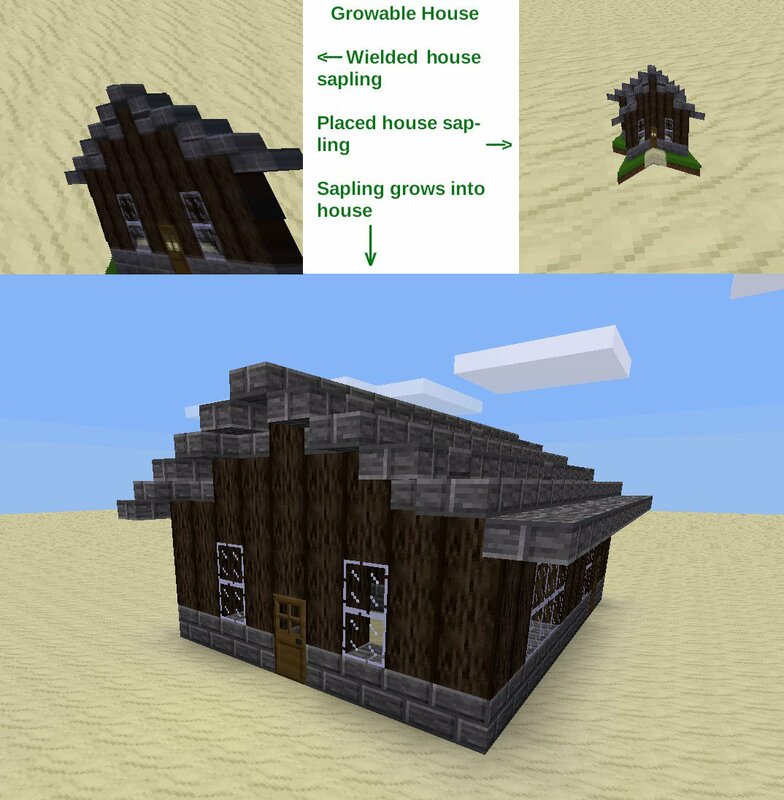 Sapier Creeper rescued from oblivion and ported from the “mobf” framework to Mobs Redo. He adds a bang to the party. Only in Final Minetest. 190328. 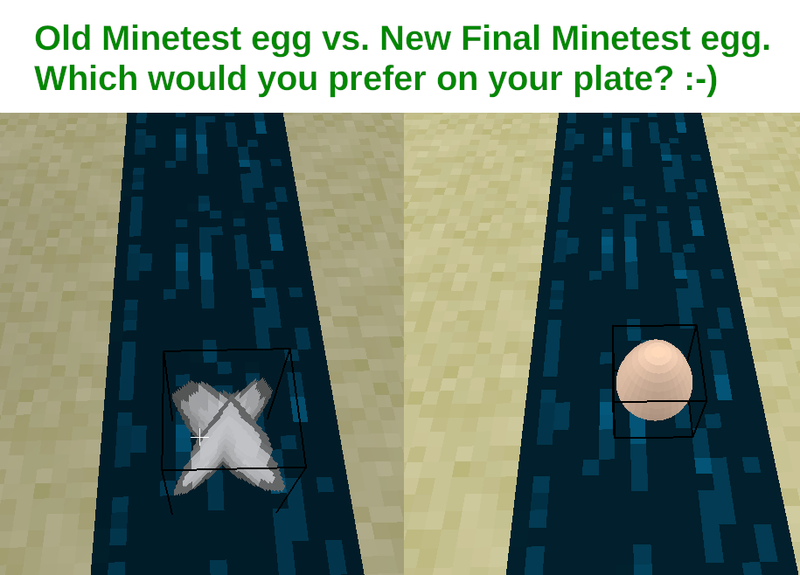 Final Minetest eggs are now 3D and realistic. 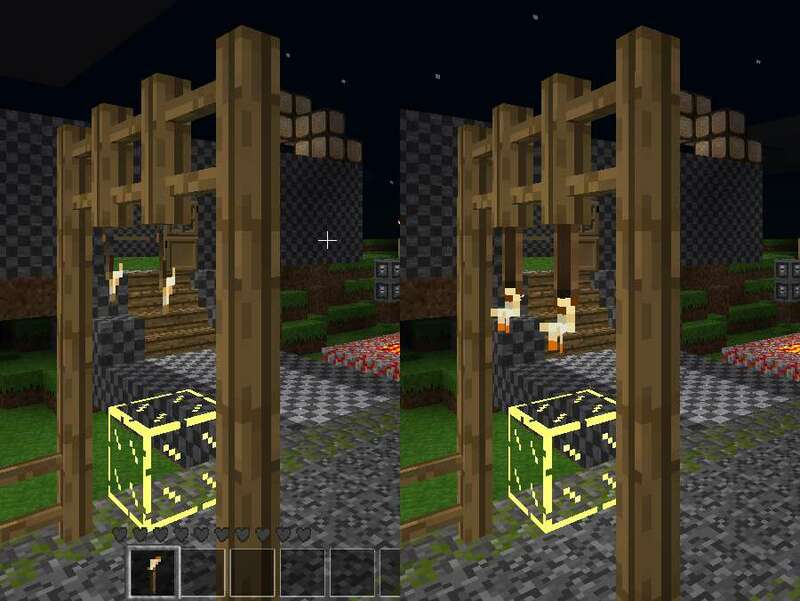 Compare to Old Minetest eggs, which resemble cardboard cutouts. 190328. 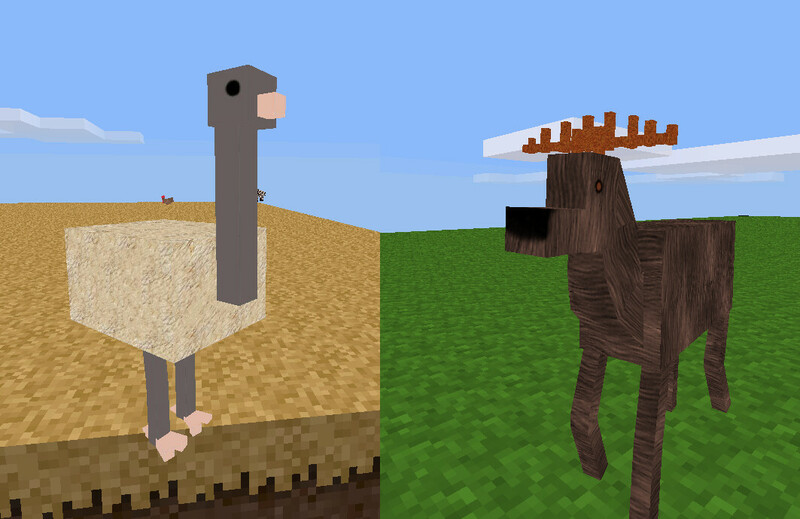 Sapier ostrich and deer, ported from “mobf” framework to Mobs Redo. Ostrich proudly sporting genuine feathers. To be joined soon by their friends Sapier Creeper and Vombie. 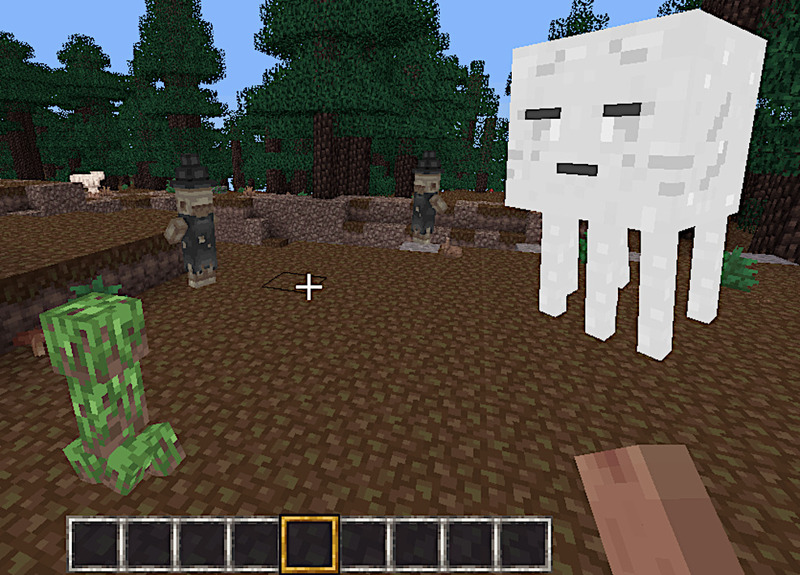 Mobs Redo version is only in Final Minetest. 190320. 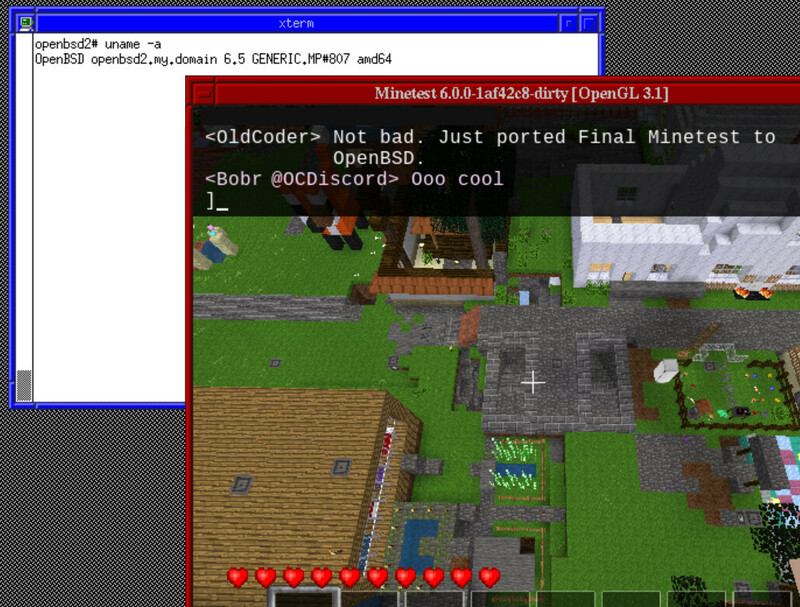 We're pleased to announce an OpenBSD 6.5 alpha release of Final Minetest 6.0.0. Yes, BSD has modern games. Other BSD OSes will be supported in due course. Menche, back for a visit after 7 years, has tested the alpha release and confirms that it works. He adds that changes will be needed in order for the package to be accepted as a formal part of the OS. But that isn't a priority presently. 190316. 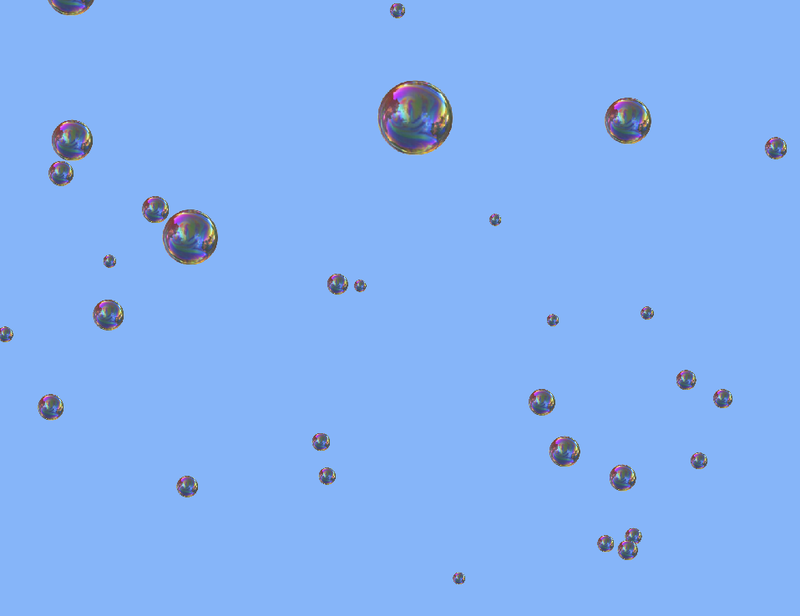 One more Final Minetest weather mode for now: Bubbles. Later, we'll look into adding Manna from Heaven and Raining Cats and Dogs. 190313. 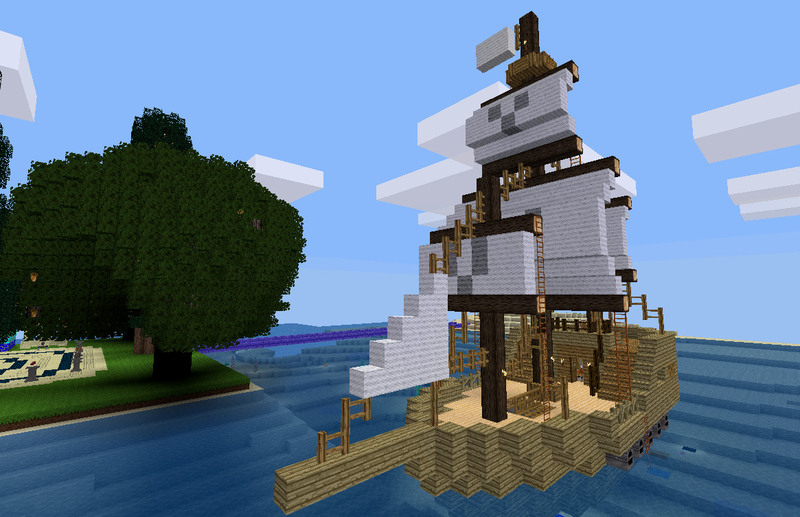 Pirate ship off spawn in Final Minetest Wonder World. Thanks go to AspireMint and Sokomine for the nautical contribution. As a separate change, Bucket Game now defaults to Classic Sneak mode. 190312. 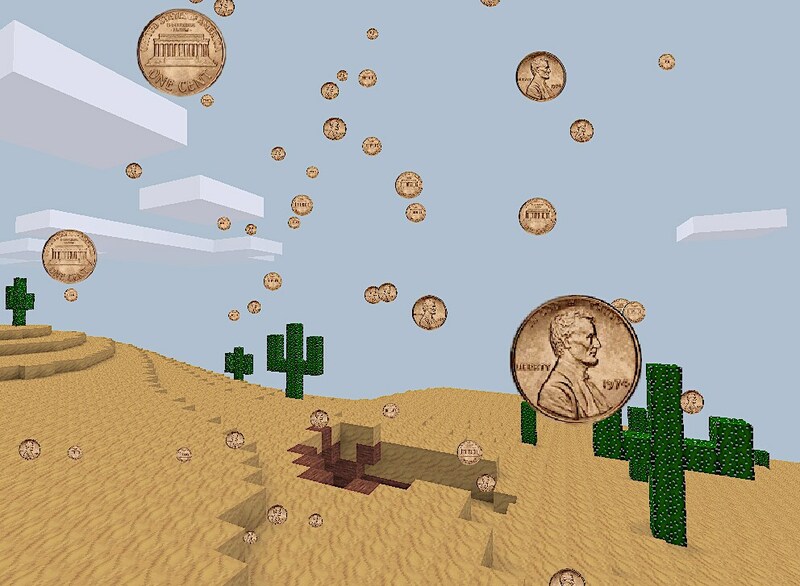 The Final Minetest weather module now supports Pennies from Heaven in addition to rain, rainstorm, snow, and Plague of Locusts. What weather module is complete without these 5 modes? Update: Scroll up to see the 6th mode, Bubbles. 190311. 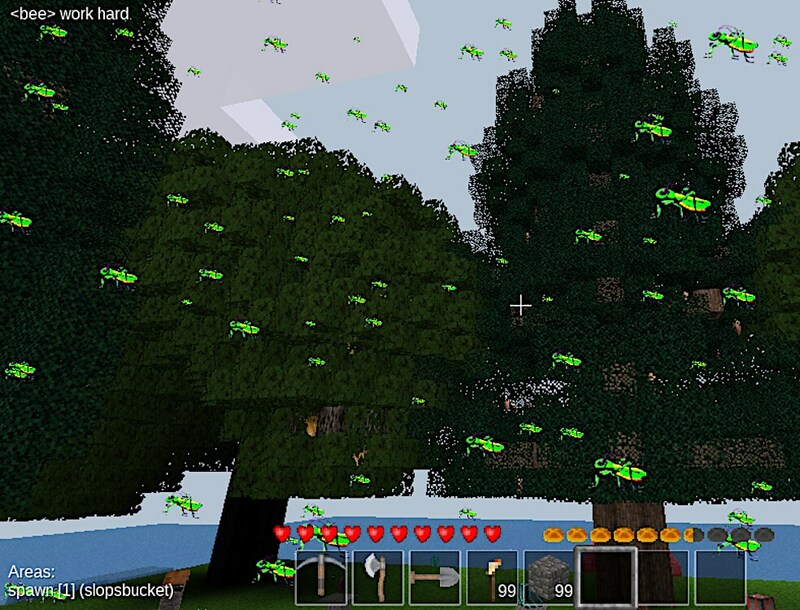 In addition to rain, snow, and storm, the Final Minetest weather module now supports Plague of Locusts for those days that call for weather of a Biblical nature. Dollars raining down and Manna from Heaven are planned future additions. 190310. 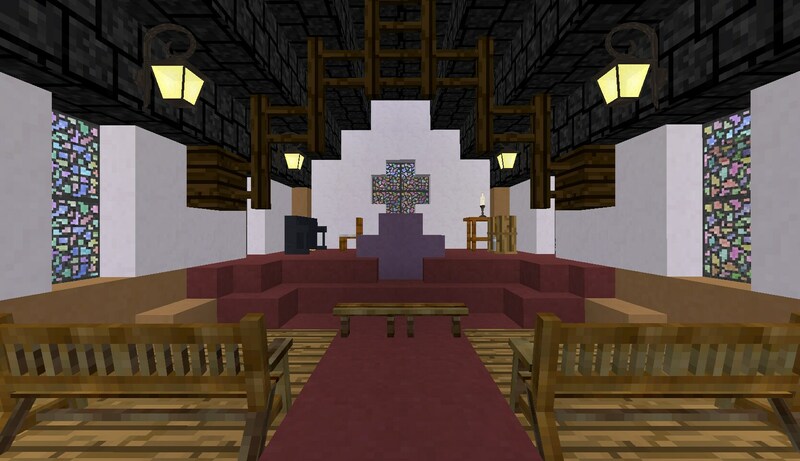 Small Church located at 3843.5, 3.5, 1998 in Final Minetest Legends of Survival. A symbol of faith and the search for meaning that perhaps is as meaningful in this context as the edifices that may be found in the physical world. 190310. Amhi, a nice lightweight world with a small-town vibe, is now hosted by, and running on, Final Minetest. As a separate note, the Final Minetest release number has been bumped to 6.0.0. 190224. Final Minetest now provides a separate MineClone2 program for those who prefer a classic atmosphere. See screenshot below. MineClone2 is 100% free and open-source. 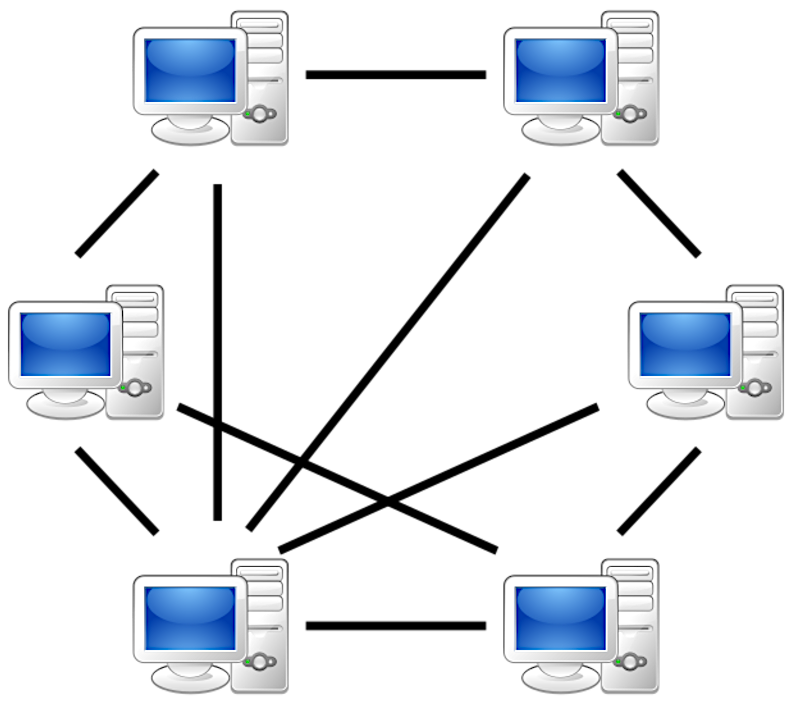 There is no connection to any proprietary software or media. 190223. 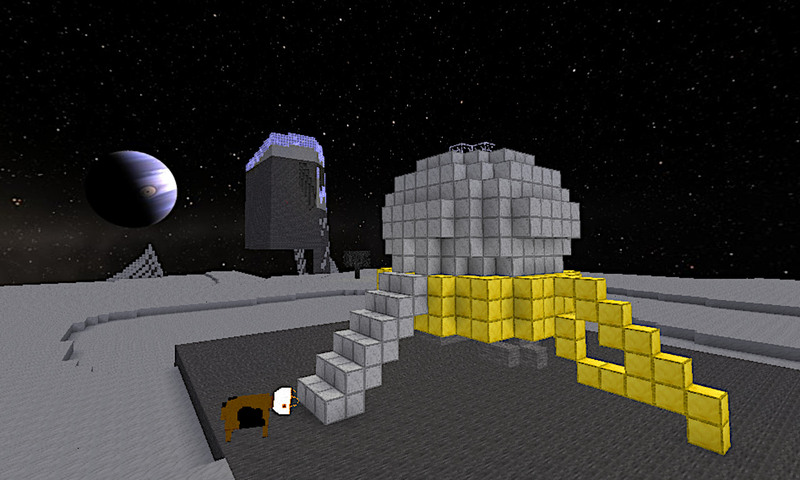 Final Minetest now includes Moontest as a built-in game mode. Moontest comes complete with an Apollo, Lunarium, UFOs, and, of course, Moo-n Cows (shown below wearing moo space helmet). There's also a separate Earth. You can travel back and forth between the Earth and the Moon. 190222. 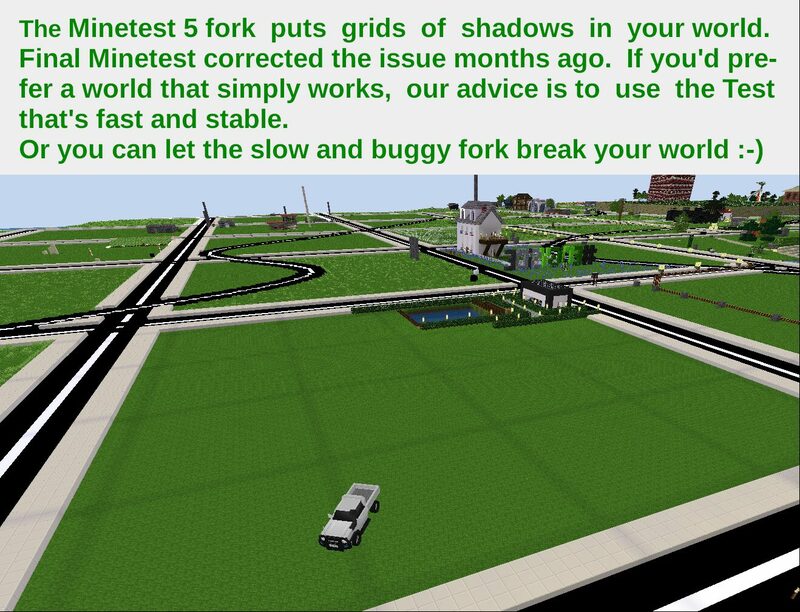 The Minetest 5 fork puts grids of shadows in your world. 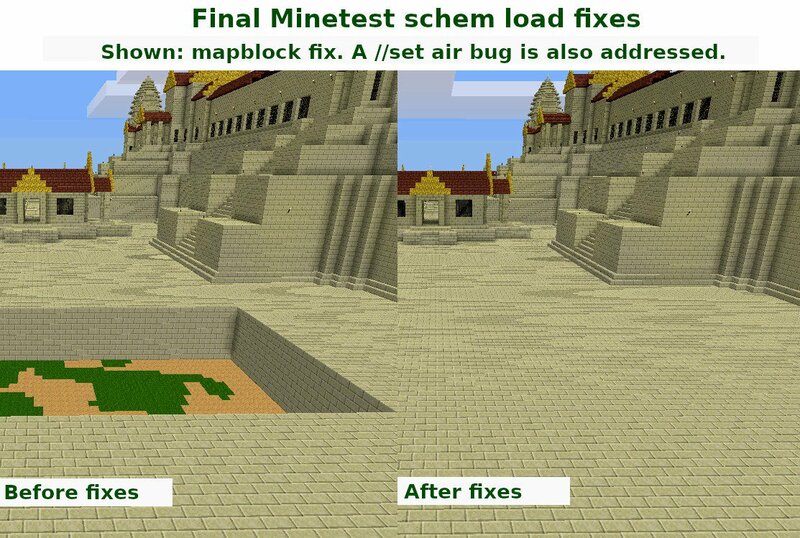 Final Minetest fixed the issue months ago. You may wish to try the Test that's fast and works. But if you feel the need to use the one that's buggy and slow, more power to you. 190220. 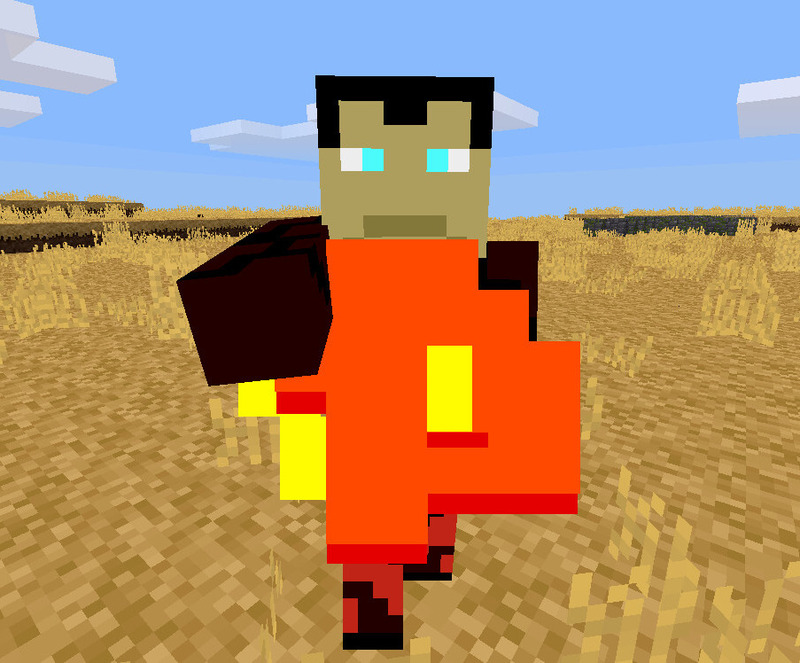 3D Armor, a popular MT modpack, is limited to 64x32 skins but the Final Minetest release now works in 64x64-based worlds. 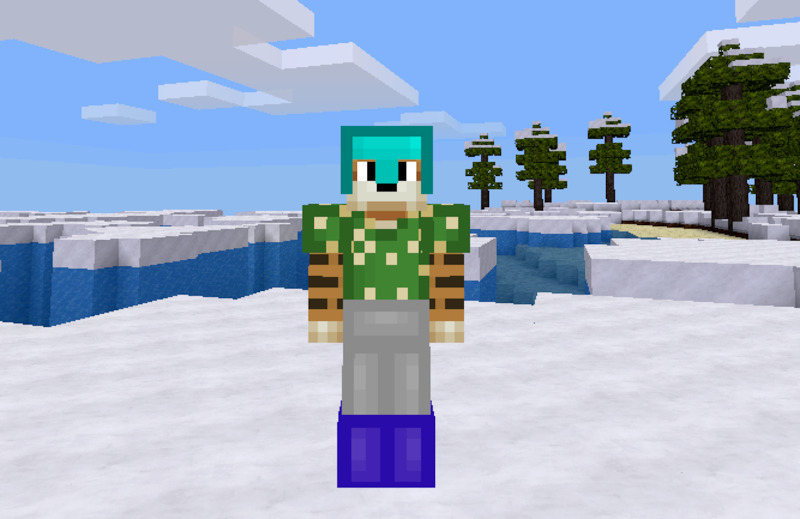 Here's Hobbes ready to rumble in style in his diamond helmet, cactus chestplate, steel leggings, and mithril boots. Old Minetest lacks support for 64x64 skins. Shrug. 190204. 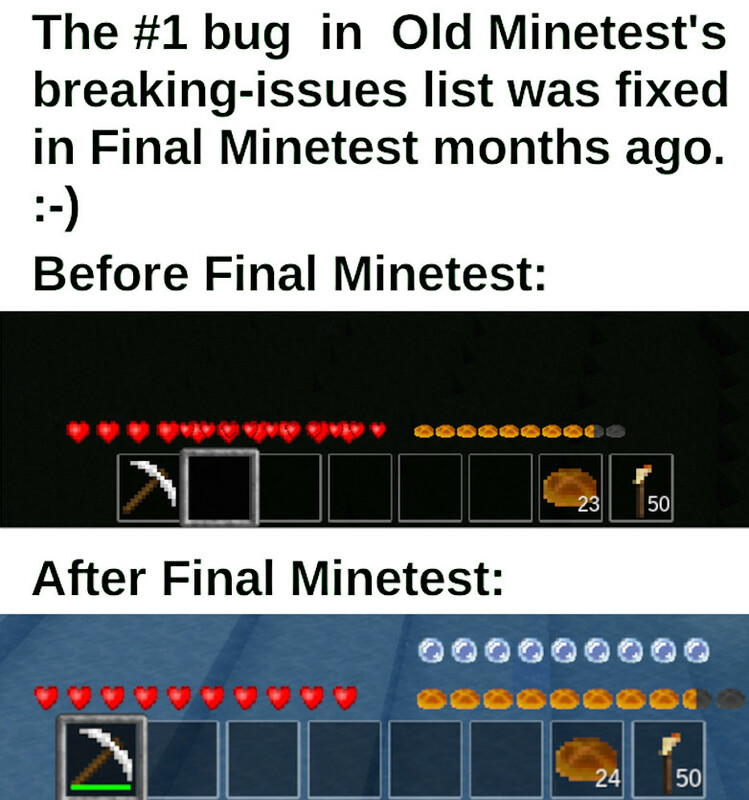 The #1 bug in Old Minetest's breaking-issues list was fixed in Final Minetest months ago. :-) See screenshot. We'd like to encourage the Old Minetest group to keep at its efforts as practice and experience lead to skill. 190202. 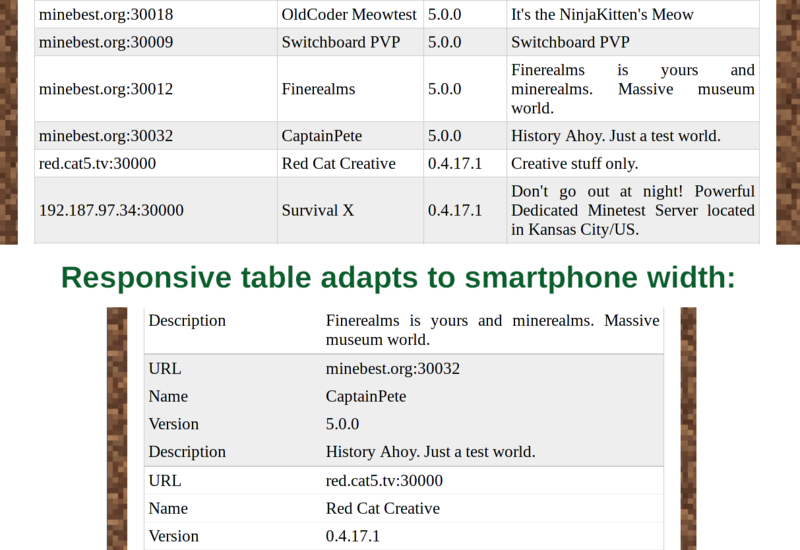 The Final Minetest server list is now P2P-based. If you're a world host and you'd like to be on a server list, but you don't want to be locked-in to any one website, you can now use P2P to have it both ways. As a bonus, in your node, you can put your worlds at the top of the list. This deal is a steal. 190129. 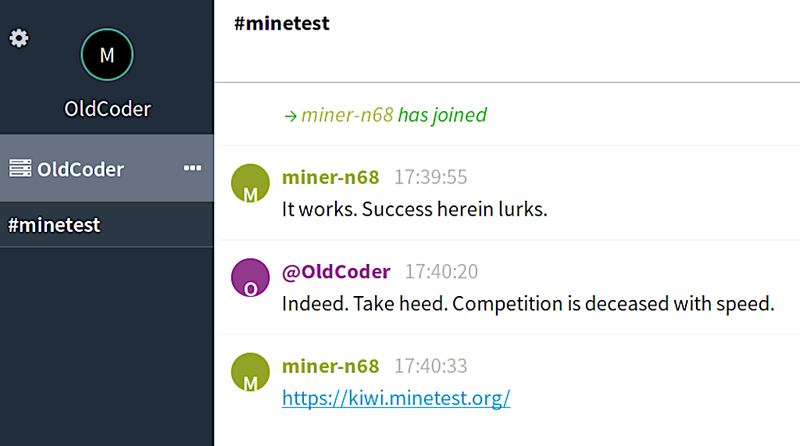 The Final Minetest website now provides its own Kiwi IRC client, including SSL. The link goes straight to live support, on duty several hours a day. Rules are enforced, but the tone is professional as compared to the toxicity in Old MT Freenode channels. Note: If you have a slow Internet connection, such as satellite, this IRC client may not work for you. We may add a lighter client to use in this case. 190127. WorldEdit in Old Minetest simply destroys buildings if you try to move them to non-mapgenned areas. 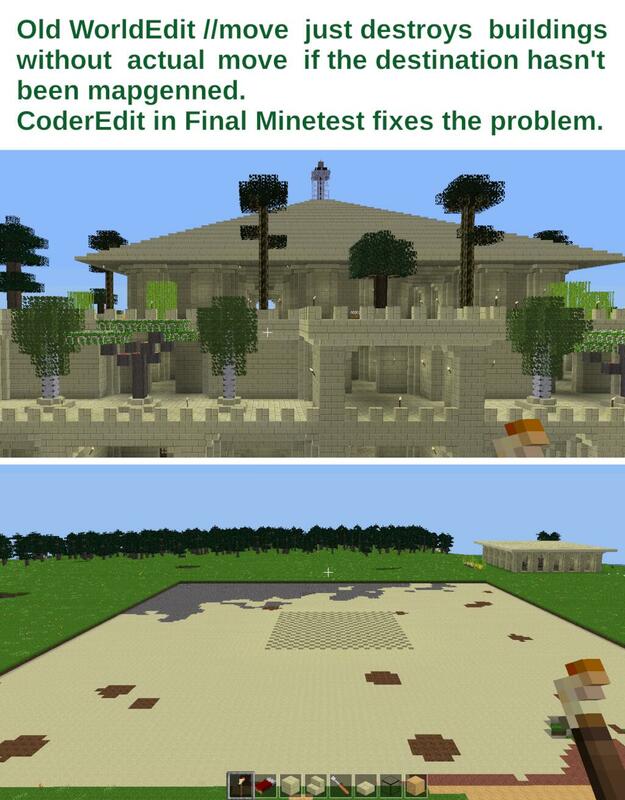 CoderEdit in Final Minetest fixes the problem. Final Minetest is the Minetest for world hosts and modders. It's the one that actually tries to preserve your work. Note the high FPS. Final MT delivers. The release will be today. 190126. 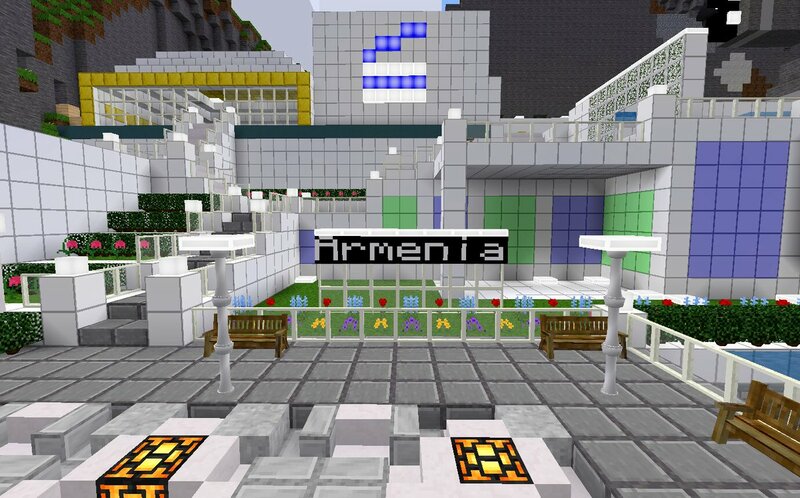 The Final Minetest server list is now online. SSL is supported courtesy of Let's Encrypt. 190122. Final Minetest now supports both 2D and 3D torches by default. Not concurrently, but only a simple settings change is needed to choose one or the other. Our controversial philosophy is that the concerns of creators related to compatibility and options do matter. 190120. This little structure would take 10 minutes to do in Old Minetest using the buggy More Blocks that doesn't support auto-orientation. 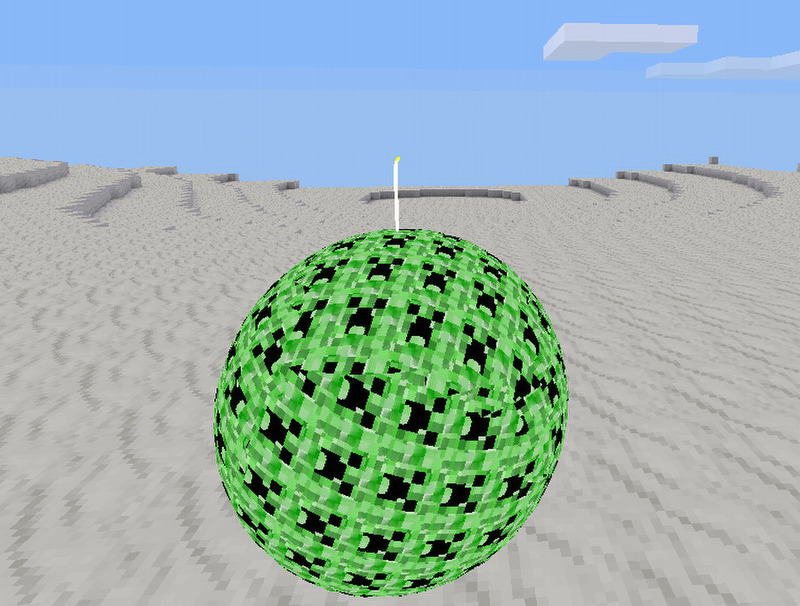 Total time required in Final Minetest, which does offer the feature: 1 minute. The public beta is coming in the next 8 days. 190106. 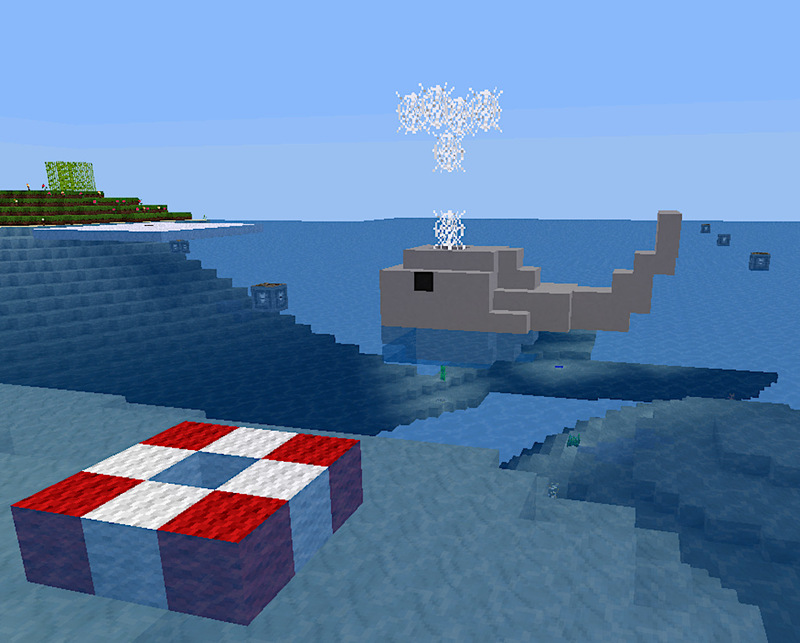 Whale of an announcement: Final Minetest is expected to be released this month before Old Minetest 5 comes out. Read the docs at the time. Final MT doesn't break your worlds. 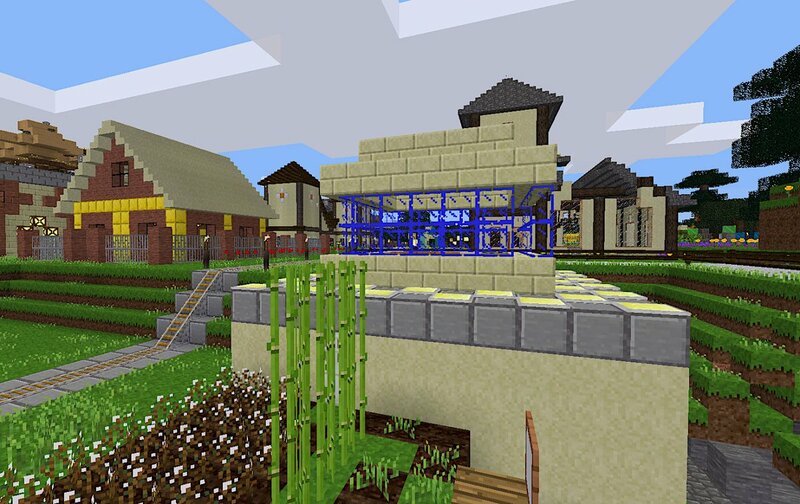 It's faster and adds major WorldEdit features, bug fixes, and a superior standard game. 190106. Final Minetest now supports a per-world settings file named “world.conf”. This solves a major problem in stand-alone mode. 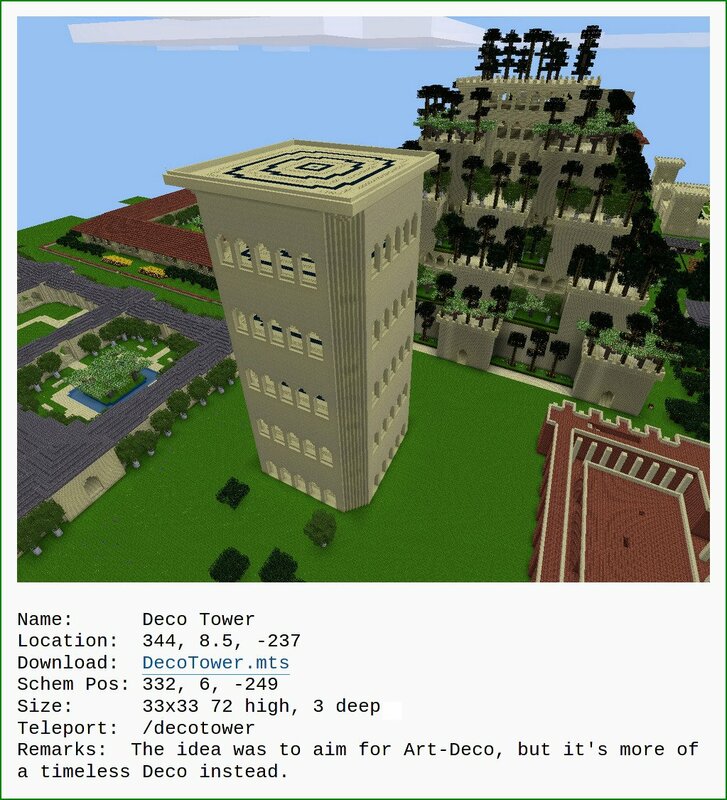 It's not clear why Old Minetest didn't have this years ago. Our suggestion is to add the feature. Below: Slopsbucket inspects Wonder World. 181227. 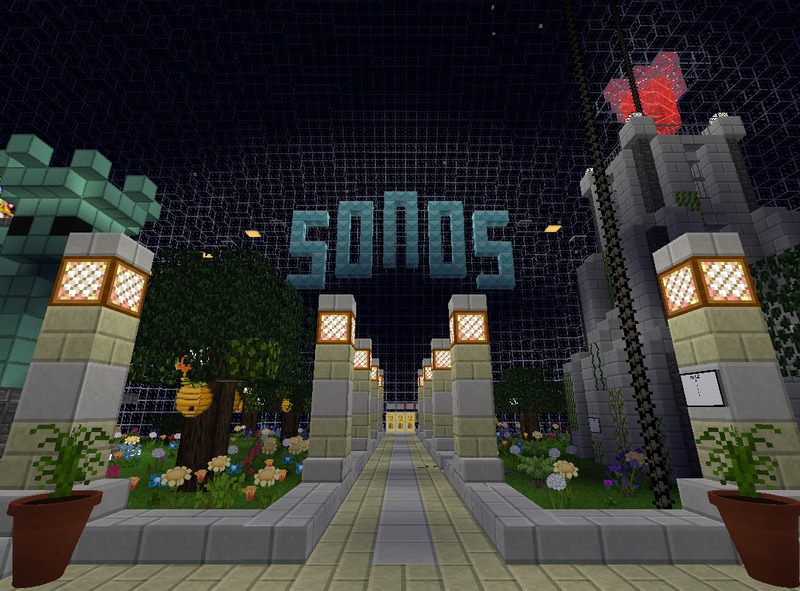 For Minetest people who dreams of free schems: Come 'n' get 'em. Added Deco Tower to the Bucket City set. One of the largest and highest quality MIT/X license #voxel #gamedev model collections in existence. 181208. 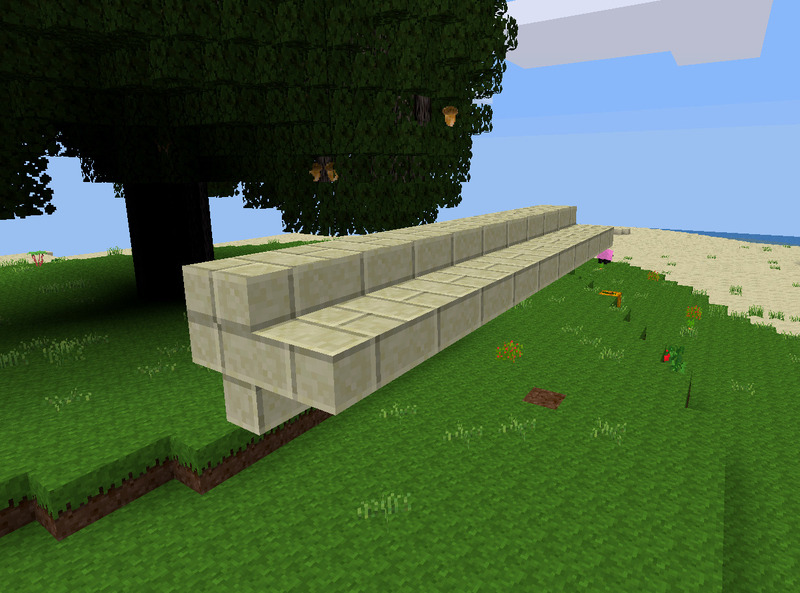 Final Minetest now provides house saplings for use by homeless builders. Wield, plant, grow a home. Everybody deserves a home, don't they? 181017. Progress on Final Minetest. Fixed a schem load bug and a long-standing //set air lighting problem. This moribund gamedev project can be revived with the right fixes and has superior edutech potential as well. Screenshot below illustrates the schem load bug fix. 180826. I visited my Minetest gamedev world SkyDoom yesterday at the request of somebody who'd misplaced their house. I found the house and these happy creatures in the backyard.